The 2-star Hôtel Thermal is situated in Aix-les-Bains, a mountain town alive with tourists and famous for the Thermes Nationaux (Thermal Baths), located just a 10-minute walk away. 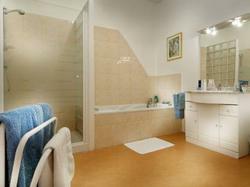 The rooms have a simple decoration and equipped with modern en suite facilities. Free Wi-Fi access is available throughout the hotel. The Hotel Thermal has a restaurant, open to non-residents every day all year round for lunch and evening meals. You can sample regional specialities in its cosy, friendly atmosphere. Local activities include tennis, a swimming pool, a theatre, casinos and ski resorts. Relaxation and wellness treatments are available on request. Rooms have either a shower or a bathtub. Please indicate your preference in the Special Requests section when making a reservation.